A mini treehouse for the mini humans in our lives, this Little Tikes Toddler Hide and Seek Climber and Swing Playground will house all the smiles and giggles. Gather the little toddlers together and get ready for some indoor and outdoor fun. This playground has a swing with a 3-point safety belt, a climbing rock wall, a slide, and becomes a slider. It's recommended for use by adorable little 1 to 4 year olds and encourages all of the role playing and imagination in the world. Get a play date in the books, because this Little Tikes Toddler Hide and Seek Climber and Swing Playground is ready for an afternoon of fun. Great, my little one love it, great deal. Bought this for grandchild's 1st birthday present. Nice that it can be used indoors or outside. Assembly does require a screwdriver and a couple of people to set up. We set it up in the playroom right before the party and the climber and slide was used right away by two little boys that were 1 1/2 years old. A little girl was using the swing to swing her baby doll. Later our 3 1/2 year old grandson was using it as a jungle gym! It did move around a little on the carpeted floor but seemed to be sturdy. I would recommend this as a first swing set for little tots. 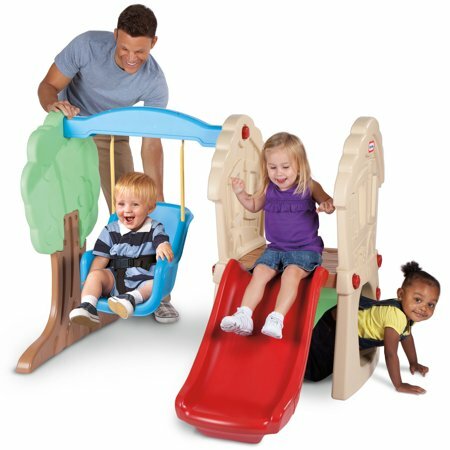 Bought this for my 9 month old...obviously not old enough for slide and climbing, but wanted something with a swing to keep in our basement for winter...she just discovered how much she enjoys swinging outside and now cold weather has set in :(. But this swing/slide combo changes everything! We can still enjoy our swinging inside! Great product. Easy to put together. Very easy to assemble. Perfect size for my one year old. Plastic does get hot in the sun so always check surface temp before allowing your child to get on it. 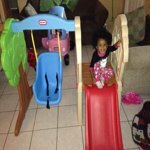 We purchased this item for our grandchildren for Christmas this year. My son said it was pretty easy to set up. My grandson (19 months) really loved the swing and is getting used to the slide. Our little granddaughter (5 months) will probably enjoy it when the weather gets warmer. I bought this for a 13 month old, and it fits him perfectly. The age range says it's for 1-4 years, but I am not sure it is the right size for a four year old because the swing was kind of small. My two and a half year old was overflowing the seat and looked uncomfortable. Also with both boys playing on it at the same time, the entire structure wobbled. I feel that it is secure for them, but I worry it won't be when they are both a few years older. Swing and side very cute and you can't beat Little Tikes prodcuts for quality. Box arrived water damaged and taped. Maybe to keep it sturdy enough to transport. I was disappointed in that because it was a gift. If not for the damaged box i would have given it 5 stars. Purchase was fire 1 and 2 year old grandsons. Bought this for my son for his first bday and he luvs playing with it. It is the perfect size for him. He is able to climb up and go down the slide himself. The swing is a lil disappointing. It is very low to the ground so u pretty much have to sit on the ground to push it. Otherwise a good product and easy to assemble.